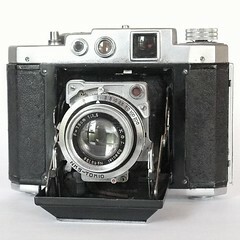 Mamiya is a Japanese camera maker founded in 1940, that progressively specialized in professional medium format cameras. Mamiya was founded in May 1940 by Mamiya Seiichi (間宮精一) and Sugawara Tsunejirō (菅原恒二郎) as Mamiya Kōki Seisakusho (マミヤ光機製作所, Mamiya Optical Works). It was based in Tokyo, Hongo, and its first camera was the Mamiya Six, a 6×6 folder with coupled rangefinder that was focused by moving the film plane. There were many versions in the Mamiya Six series, but it was the only Mamiya model for eight years. Despite the war breaking out a year after the release of the first model of the Mamiya Six, the company continued to thrive, expanding production facilities in February 1942 and again, to three times the size, in February 1944, then employing 150 staff. By March 1944 a secondary factory was opened at Tokyo University for the manufacture and assembly of lenses. 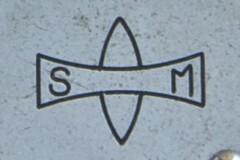 The company closed its doors in Tokyo in March 1945 and was relocated. As early as October 1945, a month after Japanese surrender, Mamiya was the first Japanese company to receive a substantial order from the Central Purchasing Office of SCAP, which allowed the company to resume full-scale production in January 1946 at new facilities in Tokyo. 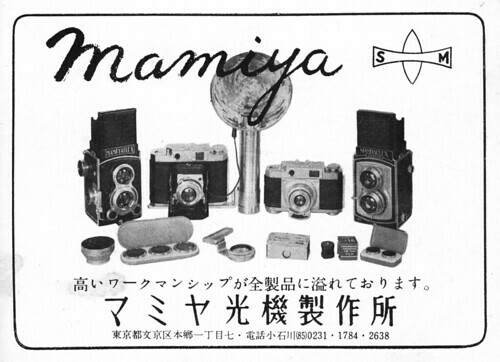 To ensure a reliable supply of lenses, Mamiya bought on optical company at Setagaya, Tokyo. Mamiya began to make its own Stamina shutters and Neocon ('new con[struction]) lenses from 1947 in the Setagaya (世田谷) plant. In 1950, the Setagaya plant became the depending company Setagaya Kōki K.K. (世田谷光機㈱), making the shutters and lenses. The name Sekor that appears on most Mamiya lenses comes from Setagaya Kōki, with r probably for renzu (レンズ, lens). Setagaya Kōki was again merged into Mamiya Kōki in 1963. From 1948 the Mamiya range became more diversified, with the introduction of the Mamiyaflex series of 6×6 TLRs in 1948, the Mamiya 35 series of 35mm fixed lens rangefinder in 1949 and the Mamiya 16 series of 16mm film subminiature cameras in the same year. Together with the Mamiya Six, these four series were the basis of the Mamiya range throughout the 1950s. In 1950, the company name was changed to Mamiya Kōki Kabushiki Kaisha (マミヤ光機㈱, Mamiya Optical Co., Ltd.). 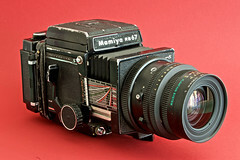 The last Mamiya Six version appeared in 1958. In 1957 Mamiya introduced two innovative designs, the Magazine 35, a 35mm camera with interchangeable backs, that only met a limited success, and the Mamiyaflex C, a 6×6 TLR with interchangeable lens pairs, that would be the first of a long series. 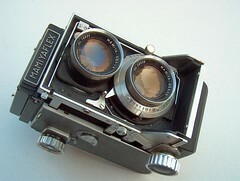 The first Mamiya 35mm SLR was the Prismat, launched in 1960. 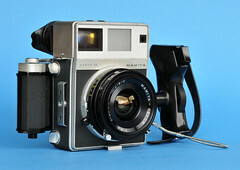 The same year Mamiya introduced the Mamiya Press, a medium format press camera inspired by some Linhof models. Mamiya dropped the 35mm rangefinders around the mid 1960s, and the range at the end of the 1960s was formed by the Press, the Mamiya C and the 35mm SLRs. The RB67 Professional 6×7 SLR in 1970, the Mamiya M645 4.5×6 SLR in 1975 and the RZ67 Professional 6×7 SLR in 1982 confirmed Mamiya's orientation towards the medium format professional market. 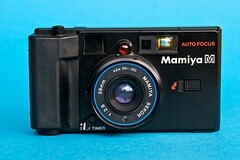 Mamiya made a last attempt towards the amateur market at the end of the 1970s with some rangefinder and point and shoot 35mm cameras, together with their continuing series of 35mm SLRs, but following the collapse of its international distributors, the company went bankrupt in 1984. As part part of the restructure, Mamiya stopped producing 35mm cameras and terminated a number of its medium format offerings (such as the Rapid Omega). After that, Mamiya continued as a specialized medium format camera maker, with new 4.5x6 SLR models beginning with the M645 Super from 1985, new versions of the RB67, RZ67 and Mamiya C, the new Mamiya 6 6×6 format rangefinder from 1989 and its successor the Mamiya 7 6×7 rangefinder from 1995. In 1993, the company name was changed to Mamiya-OP K.K. (マミヤ・オーピー㈱). During the 1990s, the first digital backs began to be available (mostly from electronics companies, not camera makers. Mamiya introduced the autofocus 645 AF 4.5×6 SLR in 1999, and made this compatible with third-party digital backs as the 645 AFD in 2001. Mamiya collaborated with Leaf; the DL28 'camera system' is the Mamiya 645 AFDIII with Leaf's Aptus-II 6 28-MP back. Mamiya offered their own 22-MP ZD digital backs (using sensors made by the Canadian firm Dalsa) and the integrated Mamiya ZD 22 "digital medium format camera" in 2005. Nevertheless, Mamiya's traditional market was increasingly taken by makers of smaller-format digital SLRs, especially Nikon and Canon. In 2006, Mamiya sold all its camera activities to an IT company, Cosmo Digital Imaging (コスモ・デジタル・イメージング㈱); the company now operates as Mamiya Digital Imaging Co. Two more models of the 645 AFD have been produced. Mamiya collaborated with Phase One, and in 2009 Phase One made a significant investment in Mamiya. As at summer 2011, the Mamiya global website describes Mamiya as 'a Phase One company'; the Mamiya USA site uses instead the slogan 'powered by Leaf and Phase One' (Leaf was also bought by Phase One). 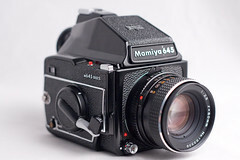 The 645 DF body (essentially the 645 AFDIII but dedicated to digital) can be seen branded as either a Mamiya or Phase One product, while the Phase One 645 AF is identical to the Mamiya 645 AFDIII, and both are available. See also Polaroid 600 and Polaroid 600SE. ↑ 2.0 2.1 The name is given in the Japanese order, with family name followed by the given name. ↑ As a partnership between the inventor and designer Mamiya Seiichi and the investor Sugawara Tsunejirō (Mamiya. A History of Innovation. Mamiya 50th Anniversary. Produced by the Mamiya-History of Innovation Editorial Committee. Bunkyo-ku, Tokyo: Mamiya Camera Co. Ltd. p. ii).—The significance of the role played by Mamiya's financier becomes obvious if we consider that his initials comes first in the Mamiya Logo (which was designed by the Japan Fine Arts School in Tokyo).—Also, according to the official company history (cited earlier), Mamiya Seiichi was 'Chief Engineer' (retired December 1954; † 6 January 1989; p. 7; 15), while Sugawara Tsunejirō was 'President' (retired June 1966; † April 1988; p. 10; 14). ↑ Mamiya. A History of Innovation. Mamiya 50th Anniversary. Produced by the Mamiya-History of Innovation Editorial Committee. Bunkyo-ku, Tokyo: Mamiya Camera Co. Ltd. p. 4. ↑ News item about the ZD (archived) on Teledyne Dalsa website. ↑ With a Stamina shutter: .